These tips on How to Catch Spring Muskies will give you a great day of fishing early in the year. Musky fishing may not really heat up until mid-summer or the trophy season fishing of fall, but spring can be some of the easiest times to catch these giant fish. If you follow a few simple tips on how to catch early season muskies, you’ll be surprised at how many fish you can put in your net this spring. Spring muskies want three things; warm water, cover and baitfish. Muskies are cold-blooded, which means that the warmer the water is, the more they will want to eat. Be sure to have a water temperature gauge so that you’ll be able to tell where the warmest part of the lake is. A good spot to start fishing is in a shallow bay that is protected from the main lake by a point of islands. It’s also a good strategy to have deep water nearby, so that the bigger fish move into the shallow bay to feed. The shallow water will absurd the spring-time sun and the north side of the bay will get the most sun, hence, the warmest water. If you can get near an incoming stream, this can add warmer water and the currents tend to attract muskies. Keep your eyes peeled for temperatures that are around the 52-62 degree mark. This is where the muskies will want to spawn, which means they will feed there heavily before and after the spawn. Spawning muskies are tough to catch but they won’t all spawn at the same time, so there will be feeding fish in this area. When a cold wind is blowing, fish are generally turned off but on warm, sunny days, the wind can be your ally. Be sure to check the leeward side of the lake when the wind is blowing on sunny, warmer days because the wind will blow the warm surface water that way. The new weeds and dead vegetation that is around the lake usually makes for a good musky location in the spring. First of all, it provides a spot that attracts baitfish. Secondly, this vegetation absorbs the sun’s heat and makes the water warmer while providing cover. Monitor the lake for small shoreline points, sand flats, docks, rocks or a bottom depression since these can all hold fish. Shallow waters like these will be warmer later in the day once they get some sun, so don’t rush out in the morning after a cold night. Fish smaller lakes that you’ve been itching to try out. These lakes warm more quickly and can produce good fishing in the spring. Mepps Musky Killers can be a great bait to fish with in the spring for hungry, aggressive muskies. Spring muskies love to chase a 5-7 inch minnow bait such as a Baby Shallow Raider or a Slammer. Jerkbaits can also give you good action in the sprint and a lightweight rod that’ll give you a short snap should do the trick. 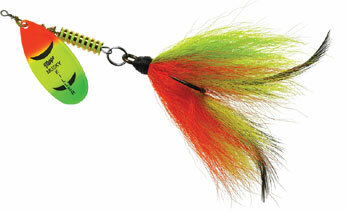 Small buck tails such as the Mepps Musky Killers are always a good choice and work especially good on warmer days. Anything that displays an injured bait fish in an area where they are plentiful works well and you can base colors on the area and action that you’ve been seeing. Don’t wait until the sun is hot or the leaves start to fall to get some of the most consistent musky action of the year. 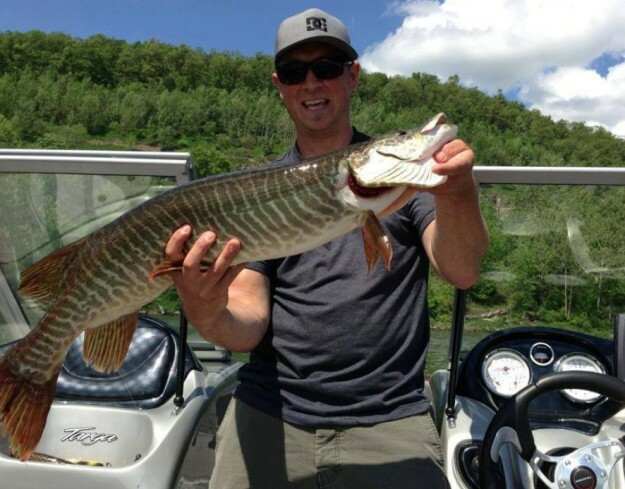 Get out and do some spring fishing with these tips on How to Catch Early Season Muskies. You can always find good fishing tips on MorningMoss.com.